Incubate at 106-110ºF. This culture has a 7-8 hour set time when used in pasteurized cow milk. Set times will be somewhat longer in unpasteurized and/or goat milk. Due to the body culture and probiotic cultures, the Mild ABY-2C is not recommended to be recultured because these cultures may not regrow to sufficient levels of benefit or at correct ratios. Small - contains 5.5 grams or APPROX. 2 tsp. Large - contains 11 grams or APPROX. 4 tsp. 1/4 tsp. for 1-4 gallons of milk. Slightly less culture may be used for quantities smaller than 1 gallon but we strongly recommend shaking the culture bottle thoroughly before using to ensure that all bacteria strains are included. When using less volume culture, user runs the risk of not getting enough of one of the bacteria strains into the mix, which can effect flavor and body. Link to Yogurt How-to Video available above and in Resources section. I would like to use raw milk and keep all the beneficial enzymes. Do I need to heat the milk to 185 F degrees to make the yogurt or can I heat it to 110 F degree? thank you. The GAPS diet requires a 24 hour yogurt fermentation. Will all your cultures work with this? Which one would work/taste the best (mildest). I know it will be quite tart regardless. Thanks. Yes all of our cultures will work with a 24hr fermentation, however it is not recommend due to the change in flavor and consistency. The ABY-2C would be the best culture for the mildest flavor. The perishable products we sell will travel just fine in ambient temperatures (60-90 degrees F) for about four to five days â€“ five days is pushing it if itâ€™s very hot outside. But that is why we choose to normally ship Priority mail through the US Post Service. Normally it takes 2-3 days to arrive to you depending on how far away you are from WI. I am eating yogurt to restore my microbiom I am eating yogurt to restore my microbiome. In your opinion, which of your yogurt cultures would have the most beneficial yogurt in your opinion, which of your yogurt cultures would have the most beneficial strains to restore gut health? I realize there are other ways too add probiotics and I am looking into them, but they are all very expensive. So as I making my yogurt, I have my own milk cow by the way, I would just like to know which cultures, in your opinion, would be the best for me. All of our yogurt cultures are equally beneficial. The ABY at the start of their name stands for Acidophilus Bifidobacterium Yogurt culture. So if I were you I would choose by tartness, the flavor you prefer. And Just and FYI the ABY-2C/Mild yogurt culture is the best seller. Another product you might want to consider would be Kefir. It has some of the same beneficial bacteria as yogurt but it also has different beneficial bacteria too. The kefir culture we sell basically tastes like a drinkable yogurt, especially if you add a bit of sugar and some flavor extract. I'm a big fan. I just finished making my second batch of yogurt. For the first batch, I used 1/2 gallon of skim milk using a deep stock pot and a deep 3 or 4 quart inner pot. It was easy to keep the milk at 185 degrees for 30 minutes. The batch turned out great with a nice consistency. For the second batch, I used 1% milk. I used the same deep stock pot but a shallow inner pot. I had trouble keeping the milk at 185 for the 30 minutes. It was likely at 165-170 for 20 minutes and at 185 for 10 minutes. While I tried to remember to stir the milk every few minutes, there were a couple of time during to 30 minute heating process, a thin film started developing then disated during the stirring. This batch has a little lighter consistency then my first batch. Is the difference in consistency due to the difference in milk, pot sizes or heati? The higher fat content in the milk the thicker your yogurt will be. If you would like a thicker yogurt and smoother texture we suggest heating your milk to 185* F and hold the temp (At least within a few degrees) for 30ish minutes. 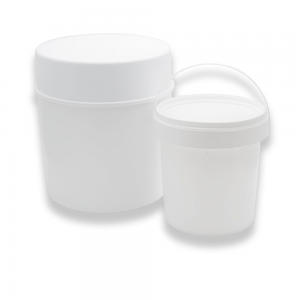 Pot size should have much to do with your final yogurt product as long as you are evenly heating your milk. Hope this helps! Thanks for the question. How much vanilla should be added to 2 quarts of milk? I understand flavoring should be added at the time of cool-down, right before incubation, right? Its really up to personal preference on how much vanilla to add. I personally like strawberry flavored extract and I add 1 1/2 teaspoon to 2 quarts (1/2 gallon) of milk. You can add the extract when ever. I normally add it when I'm warming up my milk. But you can add it during the "cool-down" stage or even add it after incubation. If you were adding real vanilla beans I would add that until after incubation. Check out our recipe. i know this may be strange, but can this product be used to make breastmilk yogurt for my baby? I am trying to avoid cows milk as long as possible. Thanks! The ABy-2C should work in breast milk, though we have not tried it. The ABY yogurt cultures and our Dairy-Free yogurt culture should work in any milk as long as there is some form of sugar source for the culture to eat. In cow's milk, the cultures (bacteria) eat the lactose (dairy sugar) which how the cultures multiply and thus, the milk is fermented into yogurt. If I use 4 gallons of milk culture to the recommended 1/4 tsp. of culture will the consistency of the yogurt be thinner than if I use it with 1 gallon of milk? I would also like to know if it is possible to use the yogurt produced with the culture to make other batches from like I have been doing with the store bought yogurt? The Consistency shouldn't change when you follow the recommend dose. You are actually using a quite large amount of culture when you inoculate the 1/2 gal of milk. But we want to make sure you get all the strains of bacteria in the culture to make consistent batches of yogurt. Yes, it is possible to re-culture your yogurt. But we don't recommend it because the probiotic cultures may not regrow to sufficient levels of benefit. Also the body cultures might grow at different ratios throwing off the flavor and texture. I travel to France frequently, where I eat lots of yogurt, pretty much all French yogurts have a very mild taste and very creamy, almost none sourness, so what kind of starter do they use? The reason why French yogurt tastes different is because Europeans are not required to put the the bacteria strain Lactobacillus Delbrueckii sbusp. bulgaricus (LBB) in their yogurt. 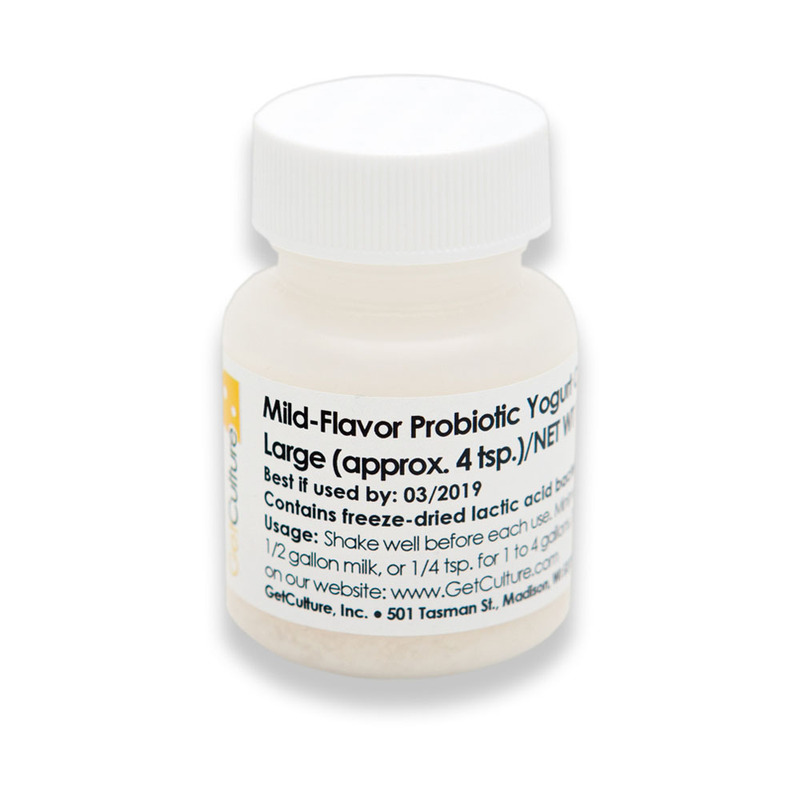 LLB bacteria strain is where much of the tart flavor comes from. In the US we are required to put LBB and Streptococcus thermophilus (ST) strands of bacteria in our yogurt if we want to sell it under the name "yogurt." The ABY-2C Mild yogurt culture would be your best bet. Especially if you incubate your yogurt at no higher than 105* F. There will not be much sourness. We sell two different sizes in our yogurt culture. A small size and a large. the Small is aprox. 2 tsp and you use 1/4 tsp for 1 to 4 gallons of milk. So the small = aprox. (8) batches of 1 to 4 gallons or (16) 1/2 gallon batches. The Large is aprox. 4 tsp. So it is double the size. Is your ABY-2C culture stored/shipped in plastic? Yes, our yogurt cultures are shipped in small polyethylene bottles. These work well for long term storage in the freezer. Are your cultures created (cultured) using pasteurized milk or is there any pasteurized milk in the ingredients of the freeze-dried cultures? Thank you! My yogurt has stopped yogueing :( I have done nothing (that I know of) differently. The milk sets up a little bit, making a thick cream, but no where near my normal thickness. Has my ABY-2C gone bad (I only ordered it in January)? If I add more culture to the batch will it work. I would hate to "waste" more milk just trying if it won't work!!! If you are keeping the culture stored in the freezer, it should have a practical minimum shelf-life of 12 months. It is possible that the yogurt culture powder may have separated and become unbalanced. It is important to mix it up each time before use as there are over 6 different culture functions in the blend. Otherwise, confirm the set temperature to be between 106-110 F. Adding more culture will only work if the culture is actually weak or unbalanced. If it is a temperature or milk issue, there won't really be a difference. How much CFU's are in one serving of homemade goat yogurt using DCI-#ABY-2C yogurt culture? There is no way we can predict how many colony-forming units will be in your yogurt. There are too many factors that play a part in how cultures grow (ex. temperature, time, etc). The only way to know for sure, is to get it tested in a lab. Can this be used with goat's milk? Yes, all of the yogurt cultures can be used with goat's milk. Your set time with goat's milk will be slightly longer (usually 2-3 hours longer); experiment with your milk to find the best incubation time. How should the ABY-2C culture be stored? On a shelf? In the refrigerator? I like this culture so much and usually make 2 gallons at a time. I use an ice chest to incubate. I use the milk from my Jersey cow, and it always comes out perfect. This is my favorite yogurt culture! I've been using it for over a year and recently bought a new bottle. The yogurt has a wonderful flavor and sets up nicely. I've never had any trouble using it. I use 1/8 tsp. for a 1/2 gallon of milk. I like to use the Yogotherm to incubate my yogurt. This culture for my taste has the perfect balance of flavor with a firm texture. When the product is freshly made it is mildly tart but develops a sharper tang overtime. The culture produces a firmer yogurt than many I have tried. I have been making a thick "Greek style" yogurt by holding the milk at 180 deg F. for at least an hour which concentrates the milk. By mixing in non-fat milk solids as the milk cools to 110 deg F. when I add the culture (1/8 t. + for a gallon) and mix well. I put then put the milk in clean wide mouth canning jars being careful to hold the temperature at 110 deg F. I place the jars into a cooler (ice chest) with 120 deg F water up to the level of the milk in the jars. Fancy equipment not necessary. The yogurt is set in 6 - 8 hours. 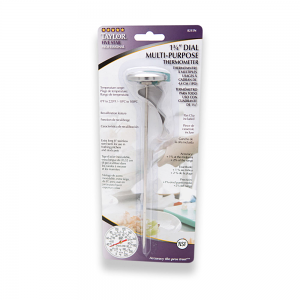 An accurate thermometer and careful temperature control is crucial for consistent success and a firmly set yogurt. This is a wonderful culture! This makes wonderful, tasty yogurt and is practically foolproof with a Yogotherm. Drained it's great "Greek Style" with honey or fruit. I just purchased this yogurt culture and it made the absolute creamiest best tasting yogurt ever. I have been making homemade yogurt for a few years now using another brand of yogurt culture that was often unreliable. I heat the milk to 180 and then add 1/2 c milk powder to 1/2 gallon of 2% milk. I then cool in a water bath to 110. At this point I added 1/8 t. yogurt culture and mixed well. I have a Yogourmet yogrut maker. I plugged it in and allowed it around 7 hours. I then refrigerated overnight. I like thick Greek style yogurt without all the whey so I strain through a fine mesh strainer for about 30 minutes. This by far is the creamiest mild tasting yogurt. I am not a fan of the tart yogurt so this is perfect for me. I add a bit of honey to the bowl and enjoyed every last drop!! I can't wait to make more!! This is fantastic culture My yogurt is thick and creamy every time. I would live to rate this as a 5 star but the site thinks I have already rated it. I love this yogurt. I've been making my own yogurt for over 10 years, and the yogurt from this culture (and all others I've tried from Get Culture, in fact) have been phenomenal. Consistent flavor and texture. LOVE IT! Yogurt made with Nigerian Dairy goat's milk from this culture is thick and so good tasting, just the right amount of tang. I do add a scant 1/3 cup of nonfat dried cow's milk to each quart and 1/8 tsp of culture. The video is helpful, especially the sterilizing of the utensils with chlorinated water: 1tsp clorox to 1 gallon of wayer. Love this culture! This is my second time ordering this one--it makes the best tasting yogurt. I just used this on my sheep milk with terrific results! We did a side-by-side experiment with this culture and two cultures from another supplier and this was by far the smoothest and thickest. I have used this starter for several years, and make 1/2 gallon of yogurt about 6-7 times a month. The smaller container lasts about a year. I even took my starter and yogurt maker with me for a 4 month stay in Germany recently. Using 1/2 goat milk when I can obtain it, is my favorite yogurt. Perfection!